Romney takes Obama to the woodshed … Romney finally has a chance to define himself and did it well. WOW, just wow … CBS snap poll following tonight’s 1st Presidential debate, the ‘Duel in Denver’ has Mitt Romney with a huge victory. 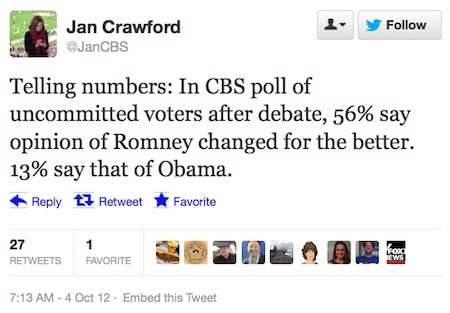 A CBS poll, yes CBS poll had Romney with a 46% to 22% victory over Obama. In the end, it was not even that close. All during the different segments of the debate Romney schooled Obama in substance and style. It was Mitt Romney who looked Presidential as Obama looked weak, meek and without focus, ideas or any grasp of economy 101. It would appear that the liberal MSM’s pronouncement that this election was in the bag for Barack Obama and over were a bit premature. After tonight’s impressive and strong debate by Romney … GAME ON! Tonight was a huge win for Mitt Romney, but more importantly a win for America. Barack Obama had no place to hide tonight as he found it impossible to defend his record. Romney stated to Obama, you have been the President and in charge for the last 4 years, if you wanted to do anything to help America you could have done it. Obviously, Obama has not. The timing of showing the film of Obama saying stupid things, the day before the debate probably contributed to his lackluster performance. I think he was shaking in his shoes to try to speak up and be confronted on it. That may be why the 47% remark was never thrown out there. Hoist by his own petard. So many secrets, so many un-presidential behaviors, attitudes. Look at the insane things public people do. Clinton and what’s her face. Edwards and what’s her face. Do people not realize Al Gore invented the internet and it will all be discoverable eventually? Boggles the mind wondering what the heck else will eventually be brought out.